Life is stressful enough without your having to spend hours slaving away in the kitchen making meals. Give yourself a well-deserved break instead and put your slow cooker to work. Once you've prepared the ingredients, this heaven-sent machine will do all the work for you. Stocks, soups and stews couldn't be easier - and this book will also show you how to expand your repertoire and make imaginative recipes that will wow. 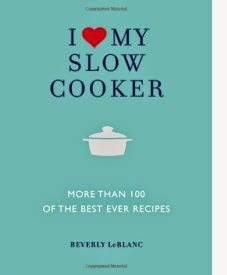 I Love My Slow Cooker gives you more than 100 recipes for hearty soups and starters, tender meat, delicious poultry and fish courses, inspiring vegetarian dishes and divine desserts. As the steam rises in a slow cooker, the flavors intensify and the ingredients become meltingly tender. You'll find here the succulent, comforting flavors that are unique to the slow cooker. Each recipe shows the time it takes to cook, and a symbol on some of the recipes indicates it's a super-easy meal. Whatever the occasion you'll find in this book everything you ever wanted - and more - for your much-loved slow cooker. About the Author: Beverly LeBlanc is the author of 11 cookbooks and was the food editor of the UK edition of Reader's Digest. She regularly contributes recipes to a number of publications, including the Sunday Telegraph and Bella. My Thoughts: I received a copy of this soft-cover cookbook to review for all of my foodie blog readers. I collect cookbooks and I absolutely love ones that feature slow cooking since I use my slow cooker 2-3 times every week. It is a "must-have" small appliance in my kitchen! This cookbook is broken down nicely into the following chapters: Introduction, Soups & Sauces, Meat & Poultry, Fish & Shellfish, Vegetarian, Desserts, Basic Recipes & Accompaniments and then the Index finishes up the book. The foodie photography in this cookbook is absolutely gorgeous...mouth-watering to be exact! When you look at the photos...you want to immediately get out the ingredients and whip up the recipe being featured. At least I did! Inside you will find recipes for: Vanilla & Pepper-Poached Pears, Two-Bean Chili, Traditional Plum Pudding, Stuffed Peppers, Spiced Figs, Salmon Terrine, Saffron Risotto, Pulled Pork, Pesto Sauce, New England Pot Roast, Lemon Pudding, Hot Chocolate Sauce, Fisherman's Supper, Dark Toffee Sauce, Curried Ground Beef & Peas, Creamy Rice Pudding, Cajun Chicken Liver Rice, Barbecue Sauce and many more!!! Overall, this is a really nice slow cooker cookbook and I am super excited to have it in my collection. All of the recipes are laid out nicely in the book, easy-to-read and the majority of them use ingredients that are readily available in your grocery stores. I give it a 9 out of 10 stars on my cookbook rating scale. You can buy this cookbook at Amazon.com.